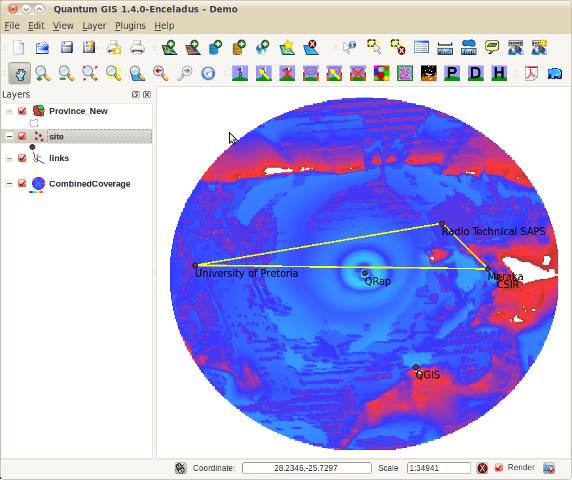 Q-Rap is an Open Source Radio Planning plug-in for QGIS that can be used by radio amateurs, Wi-Fi mesh designers, cellular operators, consultants, radio regulators students and lecturers of Mobile Communication courses and researchers in propagation prediction and cellular design. The core origin of this package was developed specifically for the South African Police Services’ Radio Technical Services which paid for the initial development and specified that the software be release as Open Source to enable the continued development and maintenance thereof. This original project was done via/by Business Enterprises at the University of Pretoria (BE@UP) and executed mainly by Magdaleen Ballot from the Department of Electrical, Electronic and Computer Engineering at the University of Pretoria. The copyright belongs to the University of Pretoria. The core propagation prediction algorithms originates from the GISRAP tool developed by the CSIR Meraka Institute, then Mikomtek at the CSIR. The copyright of the classes re-used from the GISRAP code hence belongs to the CSIR Meraka Institute. The CSIR Meraka Institute also paid for the further development of a multi-link identification tool, while the Department of Science and Technology sponsored the development of the Spectral Analysis tool for the Square Kilometer Array project. The South African Police Services (SAPS), the University of Pretoria and the CSIR Meraka Institute have all agreed to release the code under the GNU General Public License version 3. It is based on an Open Source Geographic Information System (QGIS), which enables easy integration with all GIS functionalities. It has a fairly flexible open database structure, that allows easy changes and translations. It is based on Open Source PostgreSQL. The use of Open Source Postgis enables a number of spatial queries on the data. The use of the open source package GDAL allows the use of almost any Digital Elevation Model format. Most package choices (e.g. open source Qt for interface development) were made to allow it to be Operating System independent. The database structure and design choices were made to allow for various and multiple technologies. Data that is visible can be filtered based on location, technology, project and other criteria. The core propagation prediction model is based on free-space loss calculations and the multiple knife-edge diffraction losses done according to the Deygout method. It includes addition losses for rounded hills. The effective earth model is used. The k-Factor, i.e. the ratio of the real earth radius to the effective earth radius, reflects the gradient of the refractiveness of the lower earth, and hence the curvature of the path of the radio waves. This model originates from the CSIR Mikomtek, now the CSIR Meraka Institute. Amble use of tool-tips ease use. Link Analysis including Fresnel Zone clearance. Coverage prediction that calculates the received signal strength at all points for one or many radio installations. Primary Server calculations that indicates the actual 'cell' area of each radio installation. Number of server calculations, with which coverage overlap can be determined. Interference calculations based on frequency assignments in the database. Loading of small area of the Digital Terrain Data. Spectral Interference analysis for inter-system interference analysis. Automatic tool for the identification of visible links among a set of sites.